Experiment Farm: It's Presidents' Day... Or is it? It's Presidents' Day... Or is it? Most of us have today off. If you look at a calendar it says "Presidents' Day", which it may officially be depending on in which state you live. It's interesting to note that the official federal holiday is still Washington's Birthday, and that "Presidents Day" is largely a construct of advertising companies. An early draft of the Uniform Monday Holiday act would have changed the name to "President's Day", but the version that was actually signed into law kept George's name on board. "Presidents' Day" as a concept started out in the 50s as an idea to honor the office of the Presidency with a holiday. The original date was to be March 4, the original constitutionally prescribed inauguration date. Congress didn't go for it, however, as it would have resulted in 3 holidays in just a few weeks of each other (Lincoln's birthday, Washington's birthday, and Presidents' Day). Except of course that Lincoln's birthday isn't a federal holiday. It is a state holiday in some places. For instance, growing up in Illinois, the "Land of Lincoln", we always got Lincoln's Birthday and Presidents' Day off. Then again, we also got Casimir Pulaski Day off. Some states lump Lincoln's birthday in with Washington's. Alabama, being the southern state that it is, lumps in Thomas Jefferson's birthday with Washington's (even though Jefferson was born in April) and tries to pretend Lincoln didn't exist. 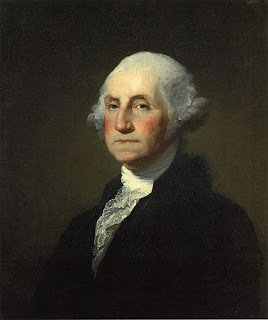 Interestingly enough, the federal Washington's Birthday holiday, or "Presidents' Day" if you prefer, never falls on Washington's actual birthday. This is the closest it gets at the day before.